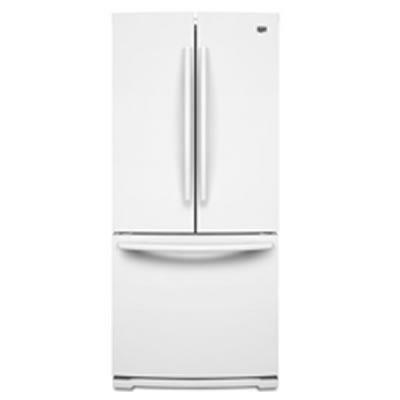 Maytag 19.6 cu.ft. french door refrigerator with Strongbox™ door bins. You can finally fit big French door benefits in your kitchen's slim 30" (76.2cm) wide opening. In the space that was previously reserved for top freezers, this ENERGY STAR® qualified model offers Strongbox™ door bins that are 50x stronger than standard door bins, a full-width fold-away shelf for more organizational flexibility, LED interior lighting and a 10-year limited parts warranty on the compressor. Plus, there's a FreshFlow™ produce preserver that extends the freshness of produce by up to 25% and a FreshFlow™ air filter that's 15 times more effective than baking soda at reducing common food odours. Total 19.6 cu. ft. / 0.56 cu. m.
Technologies Speed Cool; Strongbox™ Door Hinges; Strongbox™ Door Bins; Easy Access tilt-out bin; Fits a 30" (76.2cm) opening; Full-width fold-away shelf; Litre-plus door bins; FreshFlow™ produce preserver; FreshFlow™ air filter; FreshLock™ Crispers with Humidity Control.